Mix together the mango pulp/juice, lemon juice and essence and chill. Put into a container with a lid and put into the freezer till almost frozen. Take out of the freezer and blend in a blender and freeze again in the covered container. Repeat once more when almost frozen and freeze again. 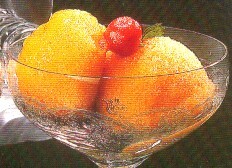 Serve scoops of the sorbet garnished with grapes and mint leaves.